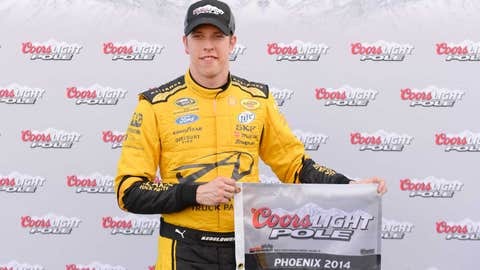 Brad Keselowski celebrates setting the pole position in qualifying for the NASCAR Sprint Cup Series The Profit on CNBC 500 at Phoenix International Raceway. Brad Keselowski won by a knockout Friday and made a little bit of history in the process. Keselowski won the pole for Sunday’s The Profit on CNBC 500 NASCAR Sprint Cup race at Phoenix International Raceway in the first knockout qualifying session ever staged in NASCAR’s top division. It was an unusual spectacle to witness and a dramatic departure from NASCAR’s traditional single-car qualifying format, which the sanctioning body abandoned for this year in all Sprint Cup races except the Daytona 500. The pole was the fourth of Keselowski’s career and the first since New Hampshire last July. The previous best start for the 2012 Sprint Cup champion was ninth in this race three years ago. "We had a really fast car and there is some pride to be taken in being the first one to win a Sprint Cup pole in this format," said Keselowski. "I am sure it will undergo a few adjustments along the way but it is very rewarding and a testament to my team and how fast of a car they gave me. Then it was just a matter of executing on my end. We were able to do that." Keselowski’s Penske Racing teammate, Joey Logano was second, followed by Jamie McMurray in a Chip Ganassi Racing with Felix Sabates Chevrolet, and Hendrick Motorsports teammates Jimmie Johnson and Dale Earnhardt Jr.
Logano also had a career-best qualifying run at PIR, though he joked about it afterwards. "I am the first loser, oh well," said Logano about his second-place effort. "The guys did a great job. Team Penske being one and two in the first time out doing this thing just goes to show all the hard work over the off-season." Greg Biffle qualified sixth ahead of rookie Kyle Larson, Kyle Busch and Aric Almirola. Completing the top 12 were Kurt Busch, Kasey Kahne and Denny Hamlin. All 46 cars entered participated in the first 30-minute qualifying session, with the 12 fastest advancing to the 10-minute final round. By setting the fastest single-lap speed at 139.384 miles per hour in the final round, Keselowski captured the pole and set a new track record. In the first 30-minute session, the Penske Racing Fords of Logano and Keselowski were fastest, followed by Kyle and Kurt Busch, Larson, Biffle and Johnson. Then came Kahne, Earnhardt, McMurray, Almirola and Hamlin. By making the field via a provisional, 72-year-old Morgan Shepherd will be the oldest driver in history to start a NASCAR Sprint Cup race. Failing to qualify were Josh Wise, Dave Blaney and Landon Cassill. The qualifying system is radically different than the old single-car system. Teams are only allowed one set of tires for all of qualifying and just one person on pit road. Typically, in practice teams would cool engines down before going out. That isn’t possible with the new qualifying procedures. "This is a huge change for us," said Doug Yates of Roush Yates Engines, the engine builder for Penske and the other Ford teams. "Usually you line up and cool the water down and you heat the oil up as hot as you can get it and as thin of oil as you can get and run a couple laps and that is it. We know how the engines react to that scenario. This is all new. How many runs are you going to make? How hot will the oil get, which drives the water temperature and how do you get it cooled back down? There are a lot of factors here." "I’m excited about the concept and I’m excited about how it is going to be so much different and I think it’s going to create a lot more interest in qualifying, but it’s the unknowns that we fear the most right now," said four-time Sprint Cup champion Jeff Gordon, who qualified 17th. Some drivers came up with a creative ad lib: driving around very slowly to get cool air in the radiator and preserve their one set of tires. It was a bizarre sight to witness and several drivers complained that the speed differential between cars attempting to qualify and those cooling their engines was potentially hazardous. "I thought that was pretty weird," said Larson. "… That was kind of sketchy for cars at speed." "The cooling is dumb," said Harvick, who qualified 13th. "They (NASCAR) needed to let everybody cool the cars down so you don’t have those cars running half speed out there. We have been telling them that for weeks." "I think NASCAR needs to look at letting us cool the cars on pit road," said McMurray. NASCAR vice president of competition and racing development Robin Pemberton said the sanctioning body would continue to look at the format, but for the first time out, he was happy. "I’m not going to grade it, but overall I’m pretty happy," said Pemberton.